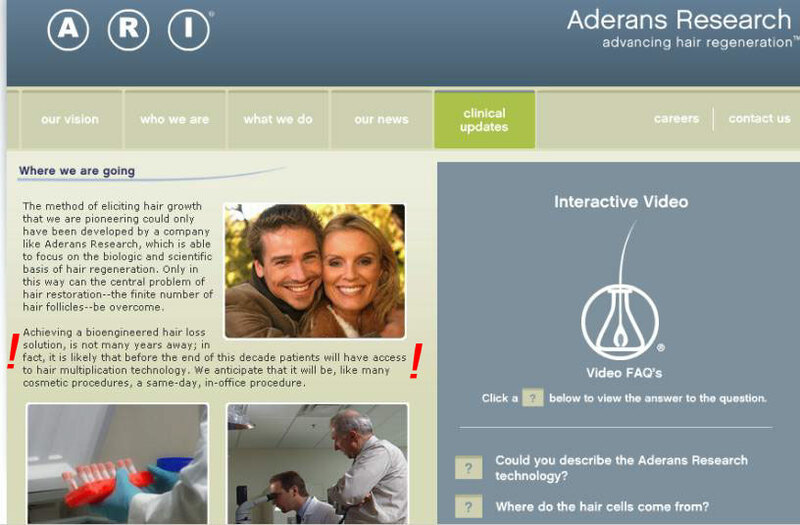 Additional information on ARI can be found at http://www.aderansresearch.com. » one year after the cell product treatment was administered. » from these protocols throughout 2011. » continued durability of response of observed hair growth. Dont understand why people are so excited about this product? First protocol done out of seven? Is that an indication of that they know what they are doing? And it took 2 years to collect one year data on the first of seven protocols. Phase 2 will take forever. And 50% resulted in significant hair growth? So half of the group had hair growth that wasnt coincidental. Not a word on how much hair or the quality of the hair. They obviously dont know how to make it work after 8 years of research. This will never see the light of day. » of seven protocols. Phase 2 will take forever. » They obviously dont know how to make it work after 8 years of research. » This will never see the light of day. To each their own. I consider this good news, and I welcome the update. I wish Follica could do the same. » » one year after the cell product treatment was administered. » » from these protocols throughout 2011. » » continued durability of response of observed hair growth. » » “We now have the building blocks for true cellular hair regeneration. » » global leader in surgical hair restoration. » » Unihair Co., Ltd. I agree with you for the most part. I do agree with you that these results are nothing to get excited about but I I’m not so sure that Aderans will never come to market. My reason for thinking that this update does not give any exciting news is that they reported that a mere 50% of subjects grew signficant hair. The percentage of subjects that grew new hair is a low percentage and the amount of hair they regrew is not enough. Keep in mind that finasteride grows “significantly” more hair in about half of patients too, and minoxidil also has similar results to Aderans. Since both Finasteride and minoxidil have similar results to Aderans, and both of them are in the marketplace, that proves that Aderans may also make it into the marketplace. Also, Aderans may improve on the percentages of subjects that grow hair and Aderans may also improve on the amount of hair regrown, but the jury is still out on those two issues. In any case, you might be right that Aderans may never come to market because Aderans is taking a long, long time to progress, and by the time they get the bugs worked out, if they ever do get the bugs worked out, there may be other products on the market that produce better results and if that is the case then the financial backers of Aderans may stop funding the Aderans project and Aderans may stop progressing altogether. can’t they test these protocols in rats or something to speed up the process ? the most efficient protocol will be discovered a lot quicker. i’m not impressed with the results. just 50%. some before & after pictures could tell us the full story. Does that mean the new hairs continue to grow 1 year after only 1 treatment? increasing the number of cells. After one month, she put the cells back into the scalps of the children, with numerous injections across the bald areas of their heads. a 50% increase in hair in more than half of the subjects. injected stem cells had migrated into the follicles. There, the stem cells stimulated the follicles to transition from a dormant phase to a hair-generating phase. I’ve never seen any solid case where a person who was bald for years spontaneously regrew his hair due to some accident or anything else. I have seen one or two letters published by doctors in some medical journal regarding one guy who grew more hair after taking something - forgot what it was I think immune-supression drugs. But the fact that in 2000 years, we have not heard of a bald guy who went to norwood 1 due to some wierd chemical reaction or drug suggests to me that once the follicle has miniturized and died, its gone forever. Its not coming back from the grave - at least not for androgenic alopecia. Alopecia areata however might be different. Maybe the follicles are still alive but in a dormant (resting) phase? All this highlights one thing - its better to treat your hairloss and keep the hair you have sooner rather than later. The window of opportunity is small once you detect you have MPB. Another thing I notice : I’ve not heard of anyone going bald after taking legitimate propecia (not generic) or avodart (brand name) from the point he first learnt he had mpb. To me this suggest you can keep your hair or severely slow down MPB if only you get on the drug at the start. » it was I think immune-supression drugs. Its because there aren’t any proper treatments, rather than the case of a dead follicle. The follicle minitaurizes to the point its producing very fine, small, colorless hair - like on most woman’s bodies. However, the follicle is still there. I’m a NW7 and I can still see dense vellus hair all over my scalp, under proper lightning. So I know the follicles aren’t dead, even though I look slick bald to everyone. Also, there was a study done in which they took minitaurized hair from bald scalp and implanted it on immuno-suppressed mice, and it grew back a terminal hair. Ironically, it grew back thicker than the terminal hair they implanted on the mouse - from same patient. So we know that the body does something that causes the follicle to stay in minitaurized state, its not really dead. My guess is that the body is actively targeting the dermal papilla cells, in the hair bulb, thus ceasing its growth potential. » cells, in the hair bulb, thus ceasing its growth potential. Cool - because ARI is actively targeting the dermal papilla since more than 8 years. So be prepared guys, because in a few days, you will have access to hair multiplication technology. Um, Ironman, what are you smoking? As for the fact that we haven’t seen regrowth from anything so far, I think that just demonstrates that we shouldn’t hope for any substance/method that’s not artificially manmade and recent. If there was a natural way to help us then mankind would have stumbled onto it by now. » In a few DAYS? » Um, Ironman, what are you smoking? » a natural way to help us then mankind would have stumbled onto it by now. i disagree… histogen shows promising regrowth results. Why? The currently running (1st) decade of the 21st century ends in a few days – right? So ARI is clearly saying (see website screenshot above) “that before the end of this decade patients will have access to HM”. Can’t you read?? What do YOU smoke? » » In a few DAYS? » » Um, Ironman, what are you smoking? » read?? What do YOU smoke? Oh … and what does now the update say? And for what an “update” at all?? That doesn’t matter. ARI clearly stated “by the end of this decade”. And this decade ends in 2 days. So, does that mean they fooled me and I can’t get a full head of hair in 2 days?? If not, why do they treat me like a fool?? » i disagree… histogen shows promising regrowth results. We don’t really disagree. Histogen falls under what I would call “unnatural” substances & methods. IMO nothing that was theoretically available to mankind 100 years ago is going to work. Probably nothing available even 20-30 years ago. The cure may perfectly well be around the corner right now, but in that case it probably wasn’t possible until recently.